The Akerworks Butterfly Kate is a multipurpose knitting and spinning tool with a carbon-fiber shaft and expanding base crafted of solid hardwood. Its foldable, lightweight design allows you to take the product anywhere and use it for a variety of different tasks. For knitting, it holds your bobbins and yarn caddies (pictured) to feed yarn evenly, eliminating tangling and twisting. It also unwinds consistently to make knitting continuously pleasurable. The Akerworks Butterfly Kate features a TensiTamer on the shaft, a special device that provides individually-tunable braking tension to the bobbin or caddy. 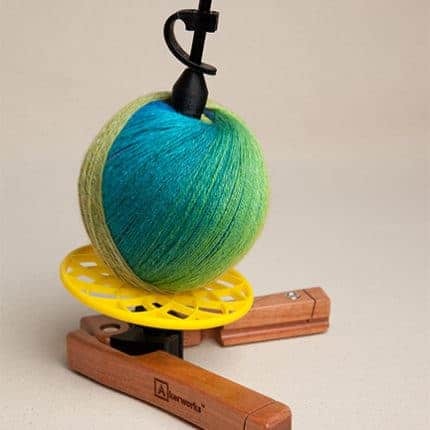 The TensiTamer can also be used as a yarn guide or spindle holder if desired. The wings of the Butterfly Kate include a magnet for holding notions and a notch to hold your pattern. For spinning, it operates as a single Kate for plying that most spinners combine with other Kates. Akerworks, Inc. is a family-owned and operated business based in Knoxville, Tennessee. Our work focuses on modern, mechanically inventive products meant to foster imagination while functioning as beautiful objects. Akerworks products are made by a combination of hand and machine work and each is made to order by a team of six makers. Our various products involve machines as varied as 3D printers, computer numerically controlled routers, or laster cutters and handwork as varied as hand sanding or hand bending hooks.